Definition from Google. noun: the avoidance, often considered as taken to extremes, of forms of expression or action that are perceived to exclude, marginalize, or insult groups of people who are socially disadvantaged or discriminated against. A simple example: If Laura, Kate and Sarah go out for lunch, they will call each other Laura, Kate and Sarah. If Mike, Dave and John go out, they will affectionately refer to each other as Fat Boy, Bubba and Wildman. Is this offensive to the men doing the nicknaming? Is it offensive to others who might hear them? Does it matter? A more complex example: As reported in the media, in a memo to students sent out by West Virginia University (WVU), Title IX coordinator James Goins, Jr. declares that anyone who refuses to use a person’s preferred transgender pronouns is breaking federal law! A political example: Robert Litan, a Democrat, was fired from his left leaning think tank after delivering testimony against an Elizabeth Warren-backed Labor Department plan to regulate financial advisers. Half of House Democrats and virtually all Republicans in Congress oppose the plan because of its costs. Instead of rebutting his argument, Ms. Warren decided to punish it, he was fired from his think tank. One ridiculous example: Princeton University’s ‘Men’s Engagement Manager’, to rehabilitate men that are too masculine. Obviously there are many more, even more dramatic, examples of political correctness gone wild in our culture today. Political correctness can be best described as the opposite of or the enemy of truth. Laura Ingalls Wilder’s Little House books are beautiful. They are also filled with racism. 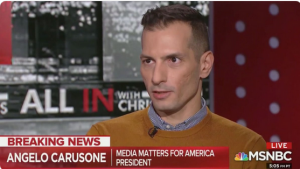 There are three very negative news stories circulating over the past two weeks that put the left in a very negative light. The first is Ilhan Omar's anti-semitism and the lack of appropriate reaction to it by Pelosi and the rest of the Democrat House or Presidential candidates. Two, FoxNews being snubbed by the DNC for a Democrat Presidential Debate in 2020. due to their right wing propaganda (as if CNN, MSNBC, CBS, ABC & NBC don't market in left wing propaganda). This is getting extensive backlash as the left wing media tries to substantiate that decision. And, a third, Democrats (Schiff) met with Cohen for up to 10 hours to prepare his Congressional testimony in which he continued lying. As is the practice on the left when news they don't like hits the airwaves, they move to get it off the front page with another story, hyped to put maximum pressure on the right. When the Inspector General's report about the FBI came out last year, devaluing their 2 year 'Russia' narrative, they took it off the front page with the "separating babies at the border" story. No matter whether Obama had done the same thing. No matter whether Trump issued an executive order to stop it and was stopped by the courts. Truth doesn't matter. Perspective doesn't matter. Just sensationalizing a story negative to the right, to get the left's negative news off the front page. Welcome to that again with the left's over hyping of negative comments made by Tucker Carlson over a decade ago. Never mind if they are presented accurately by the leftist news organizations. Never mind if people on their own networks get cover for doing much worse. Just get the negative news off the a front page. And, this attack on Carlson is not new. Last month they (leftist brown shirt Antifa mobs) attacked Tucker Carlson's home. 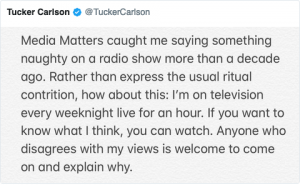 They have been after Tucker Carlson because his show is a success (3 million viewers) and attracts young people. He has open dialogue with those who think differently than he does, while left wing networks actively censor other opinions (think Meet The Press' Chuck Todd denying anyone with different views on climate change to participate. Or, CNN not allowing the word "mobs" to be used to describe --- mobs.). That pretty much says it. Anti-fascists & counter-protestors, you are right, there is no moral equivalence. You are worse! Political Correctness/Pop Culture Priorities At Work On The $10 bill? Northam says he "was born in white privilege"